We look forward to asparagus season every spring. We have a number of dishes we love to use it in like this vegan asparagus soup. 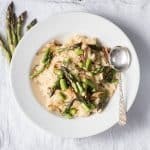 And today we’re sharing our recipe for Instant Pot Asparagus Risotto. Lately, I have become obsessed with our Instant Pot. It saves time and when you’re a busy family and there are more things in the day then you actually have time for then you look for time saving shortcuts. You understand what I’m saying, right? 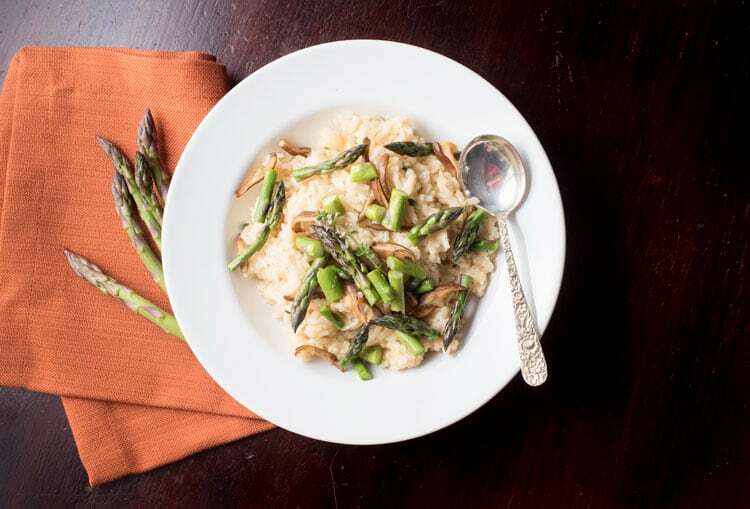 And the great thing about making asparagus risotto in the Instant Pot is that you save time without sacrificing flavor. Initially, I had no idea how to use our Instant Pot. It literally sat in the box for several weeks and I would stare at it when I walked by. But when I finally broke the seal and tested it out, I realized it was super easy and I was instantly hooked. The first recipes tested were simple things like brown rice and applesauce. Then, as I got more adventurous, we moved on to soups, Instant Pot Chili, and even Instant Pot Cheesecake. 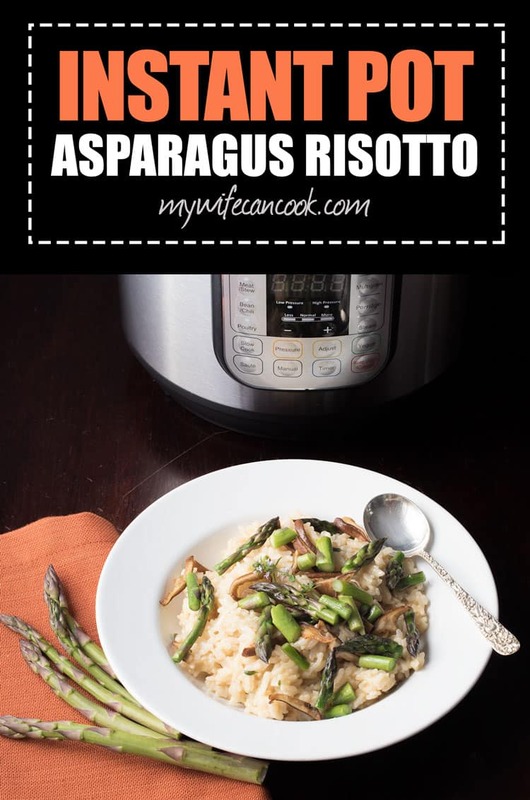 Recently, I realized it would also be easy to adapt our asparagus risotto recipe to the Instant Pot. 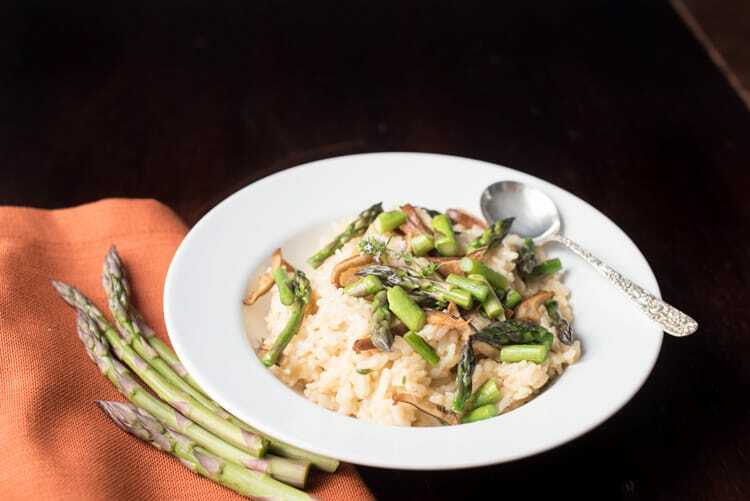 I personally like my asparagus still a little crunchy, so I found I liked it better if I sauteed the mushrooms and asparagus separately and then added them in to the Instant Pot after releasing the pressure and stirring in the other ingredients. However, if you like your asparagus cooked longer, you can just as easily add the mushrooms and asparagus right before closing the lid. A third option for those looking for a one pot meal is to set the manual cycle to 6 minutes. Once it is done, do a quick release, keep the instant pot on warm, add the asparagus and mushroom with an additional 1/2 cup of broth. Stir and let cook for 5 minutes (add more broth is risotto gets too dry). Then shut off the warming cycle and add the thyme, lemon zest, butter, and cheeses and stir. And the result is amazing, look at that asparagus risotto! Thanks to Jenny for having us on to guest post! 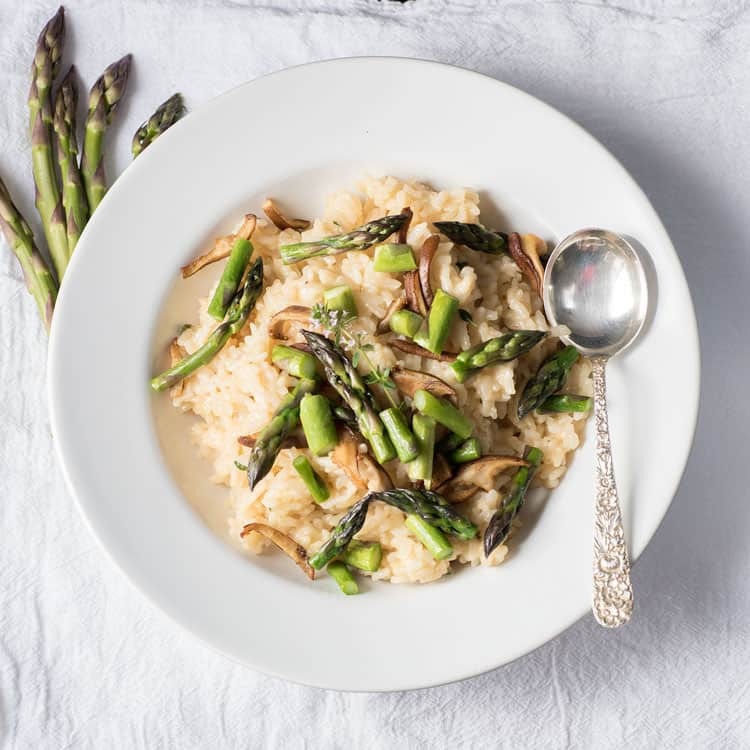 The great thing about making asparagus risotto in the Instant Pot is that you save time without sacrificing flavor. Press the saute button on the Instant Pot and add olive oil. Once oil has heated up, add shallot and garlic, stir, and cook for approximately 1 minute. Pour in wine and stir to loosen any bits on the bottom of the pan. Add broth and close lid. Close the vent and press manual and toggle to 7 minutes. While rice is cooking, saute mushrooms in 1 tablespoon of olive oil for 5-6 minutes, then add asparagus and cook for an additional 3-5 minutes. Stir in thyme, lemon zest, butter, both cheeses, and sauteed mushrooms and asparagus. If rice seems to dry, add a small additional amount of broth and stir. Yummy! Such a perfect combination of my favourite ingredients! Awesome recipe!